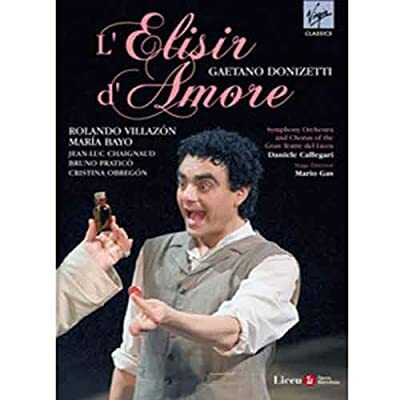 Donizetti's "L'Elisir d'Amore" is lots of fun, especially with Rolando Villazon playing the silly Nemorino. He's really funny and vocally he's in such good form that the audience demands (and gets) a repeat of his big aria "Una Furtiva Lagrima". 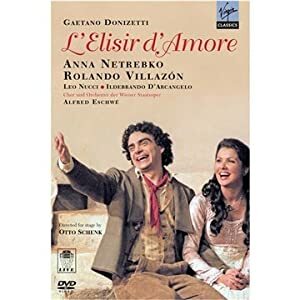 Leo Nucci as Villazon's pompous rival for Netrebko's love puts on a good show too and Anna is her usual adorable self. 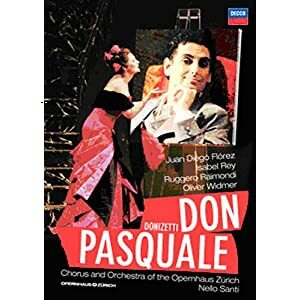 I also have a DVD of this opera with Pavarotti and Kathleen Battle and even though these two are vocally just as good or even marginally better than Villazon & Netrebko - Pavarotti is too much of a statue compared to the lively almost Chaplin-esque Villazon, and that's why the Villazon & Netrebko DVD makes for the more entertaining of the two. Last edited by jhar26; Dec-26-2010 at 12:57. Two very different productions but I love them both. However in the Korsten one in Act II 'Provato, ho a prenderti' one moment Norina has a handkerchief or money (something white anyway) in her cleavage & the next moment she hasn't & it isn't in her hand. Then next shot it's there & next shot it isn't. If it was a movie I would just put it down to bad editing as I know scenes are re-shot numerous times. My question is - do they ever stitch together/splice scenes from different productions? As an answer to Sospiro's question: they very often do combine footage from different consecutive performances to achieve the best result. Last edited by Herkku; Apr-24-2010 at 16:43.
and as you can see Ciofi is Marie in the second one. 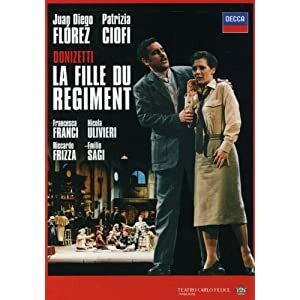 This is the only DVD I have with Ciofi & no complaints vocally but I didn't like the production, especially compared with the Dessay version. 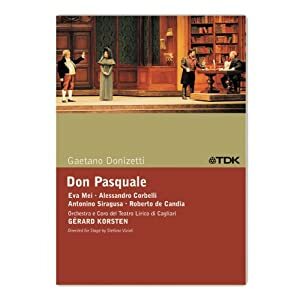 This is only my opinion but for me as long as Don Pasquale & Dr. Malatester are good then Norina doesn't matter so much. In the Flórez version the patter duet (Act3 Aspetta, aspetta) is absolutely fantastic & Raimondi & Widmer do an encore. 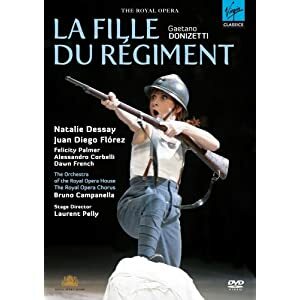 I got it as a JDF double pack with the La Fille & have watched it lots of times. I expect you've seen JDF's Com'e gentil on YouTube. Exquisite as is the accompaniment. Not read the Amazon reviews but I adored Raimondi's Don. 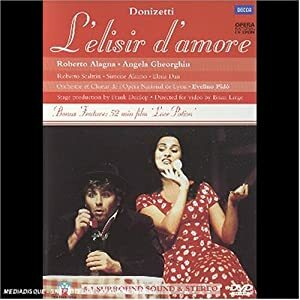 Although I really like the quality of Gheorghiu's voice I often find she is playing Angela the Diva rather than whoever her character is - in Tosca, la Rondine, Traviata, even in her Madama Butterfly CD! So in this DVD - did you feel she was Adina or Angela? I haven't finished it yet. 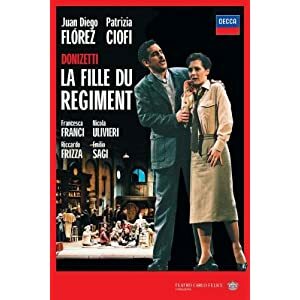 So far so good, both Ciofi and Flórez are singing beautifully (he's a specialist in this role). The action is transposed to WWII which I don't know if I'll like, we'll see. ... Neat, Flórez gave us an encore of Ah, mes amis...Pour mon âme, so that we got 18 high Cs!!! "The opera was originally set in Tyrol, during Napoleon's invasion. This production is updated and relocated to France in about 1945. Aside from the fact that the costumes and scenery are much less attractive in this setting (U. S. army uniforms were designed for utility, not style, and twentieth century nobles dressed far less elaborately than those of the Napoleonic era), the change of time and locale makes nonsense of much of the plot. It was perfectly reasonable for nineteenth century Tyroleans to fear Napoleon's soldiers, but why would French people of 1945 fear American soldiers and refer to them as "the enemy"? And how did an American regiment adopt a French orphan in the 1920's and take her with them when invading the continent twenty or so years later? Libretto alterations intended to adapt the words to the changed circumstances cannot make sense of these things. Moving the setting forward by nearly one and one-half centuries still leaves it about sixty years in the past. Can such a change really make the drama more meaningful to today's audiences? I believe that audiences respond to music drama according to the feelings of the characters and their responses to the situations in which they find themselves, not according to the clothes they wear or the technology they employ. Filmmakers have presented drama successfully in settings ranging from prehistoric to futuristic without any fear that the audience would be unable to identify with their characters. Why do opera producers and directors feel a need to tamper? Presenting a work as its creators intended need not limit the creativity of its producers. It is possible to illuminate a work without altering it." Exactly! My compliments to that Amazon.com reviewer. Last edited by Almaviva; Sep-18-2010 at 03:03. All times are GMT +1. The current date and time is Apr-24-2019 23:50.